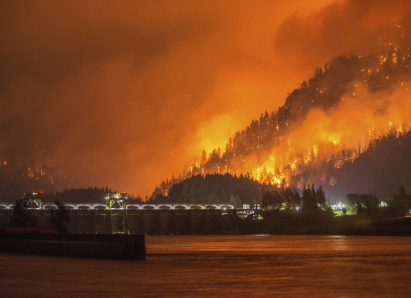 The raging Eagle Creek fire in the Northwest’s beloved Columbia River Gorge brought destruction to some and difficulty to many. Last week charges were brought against a 15-year old for allegedly starting the blaze. The situation raises enormous and complicated questions: what jurisdiction controls (federal or state, juvenile or adult), whether climate change and other environmental factors played a role, and whether massive fires are unique to the West? Teachers may focus student inquiry into several different areas using these rich and textured materials on FIRE. The Eagle Creek Fire is an ongoing wildfire in the Columbia River Gorge in the U.S. states of Oregon and Washington. The fire was started on September 2, 2017, reportedly caused by teenagers igniting fireworks during a burn ban. Reckless Burning Law and Legal Definition. CLP: interesting legal questions about the secrecy of proceedings surrounding the boy charged with igniting the fire. CLP: what price should be paid? Why is fire considered a threat? What are the long-term results of a forest fire? Why is the area of the burn subject to floods and landslides? What is the effect of fire on endangered animals? How does fire pose a serious threat to undocumented residents of a burn area? What are the causes of recent large fires? What could be done to prevent future fires? What resources are needed? What is “urban sprawl”? Is there a connection between climate change and fires? Is there a connection between overdevelopment and fires? Do wildfires pose a problem in other places in the United States? Elsewhere in the world? Is blame a constructive way to move forward after a disastrous fire? How is fire the result of multiple factors? What changes do we need to make to avoid fires in the future? Are methods of firefighting changing? What charges could be made in the Eagle Creek Fire? What law enforcement authority has jurisdiction over the person charged in the Eagle Creek fire: federal or state, adult or juvenile? Was this a negligent act? Was it a reckless act? Was it an intentional arson to start a forest fire? What is the meaning of “intent”? How are juveniles treated in our court system? How should juveniles be punished for actions that cause harm to others? Why are the names of juveniles kept out of the news? What is a “deadly prank”? Why do juveniles do “stupid” things? Why are juveniles attracted to fires? Is unwise behavior more likely in teenage groups? What responsibility do we have to discourage others from dangerous behavior? Do we have a responsibility to dissuade our friends from reckless acts? What is arson? What is reckless burning? What are the long-term effects of large fires? What about general dislocation, floods, landslides, loss of income, housing shortages, tourist decline, business losses, government costs to restore civic life, etc.? What is our policy on wildfire and forest fire management? Should it be changed? What are current best practices in wildfire management? What educational tools might be used to promote fire safety? How might the threat of fire bring people together? Countries together? What are examples of public outpouring to help fire victims? CLP: learn how wildfires start, how big a threat they are and more. CLP: fire and other disasters can bring enemies together! FOCUS on FIGHTING FIRES – Fire Safety: Activities to Spark Learning! CLP: legal questions about the secrecy of proceedings surrounding the boy charged with igniting the fire.